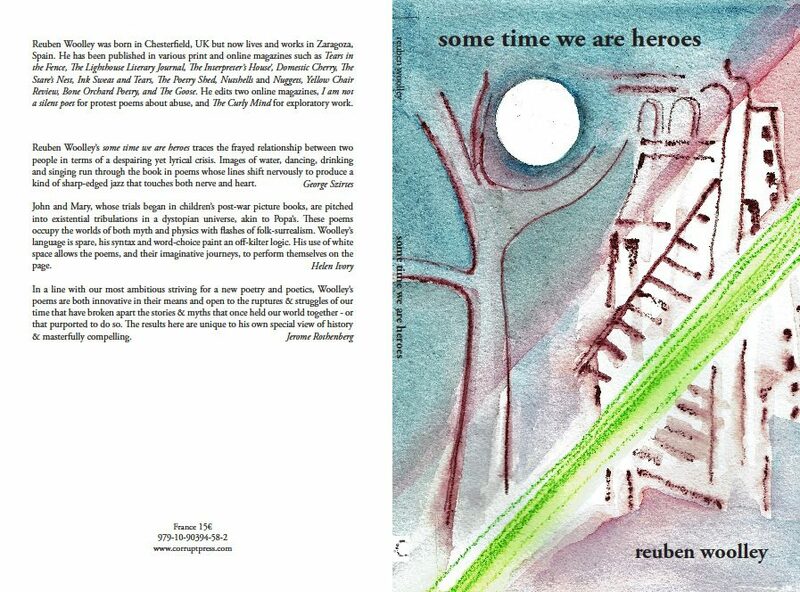 My proof copy of my new collection, ‘some time we are heroes’ has arrived. It will be available on the Corrupt Press web page in September and I shall be getting a few copies for scribbling in and sending as well. Remember that postage from Spain isn’t cheap so, unless you really want that scribble or live in Spain, you should get it from The Corrupt Press. All my thanks to my editor, Dylan Harris, to Helen Ivory, George Szirtes and Jerome Rothenberg for saying such good things about it for the cover and to Nick Cooke and David Pollard for commenting on an early draft. Thanks also to Jan Stead for the cover painting. Reuben Woolley’s some time we are heroes traces the frayed relationship between two people in terms of a despairing yet lyrical crisis. Images of water, dancing, drinking and singing run through the book in poems whose lines shift nervously to produce a kind of sharp–edged jazz that touches both nerve and heart. John and Mary, whose trials began in children’s post–war picture books, are pitched into existential tribulations in a dystopian universe, akin to Popa’s. These poems occupy the worlds of both myth and physics with flashes of folk–surrealism. Woolley’s language is spare, his syntax and word–choice paint an off–kilter logic. His use of white space allows the poems, and their imaginative journeys, to perform themselves on the page. In a line with our most ambitious striving for a new poetry and poetics, Woolley’s poems are both innovative in their means and open to the ruptures & struggles of our time that have broken apart the stories & myths that once held our world together — or that purported to do so. The results here are unique to his own special view of history & masterfully compelling. This entry was posted in Poetry and tagged Reuben Woolley on June 26, 2018 by reubenwoolley.